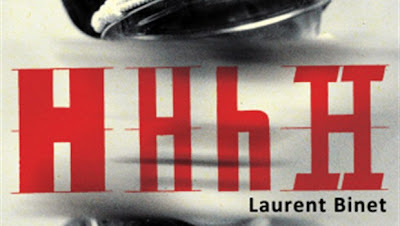 "HHhH is the debut novel of French author Laurent Binet. It recounts Operation Anthropoid, the assassination of Nazi leader Reinhard Heydrich in Prague during World War II. It was awarded the 2010 Prix Goncourt du Premier Roman. The novel follows the history of the operation and the life of its protagonists – Heydrich and his assassins Jozef Gabčík and Jan Kubiš. But is also interlaced with the author's account of the process of researching and writing the book, his commentary about other literary and media treatments of the subject, and reflections about the extent to which the behavior of real people may of necessity be fictionalised in a historical novel. The title is an acronym for Himmlers Hirn heisst Heydrich ("Himmler's brain is called Heydrich"), a quip about Heydrich said to have circulated in Nazi Germany." In many ways, the QMBC can be compared to a lengthy, heated argument between drinking buddies. Often out of sheer frustration, one side resorts to calling the other a Nazi and automatically loses the argument. However, it appears that the exact opposite is true for QMBC book nominations, if one is frustrated by the book nomination process then the suggestion of a contrarian-elitist literary trip to Nazi-town and you are away in a hack, Jack. What will the liter-Aryan supermen of the QMBC make of their first visit to Nazi-town? Who knows, only time will tell meine Damen und Herren.